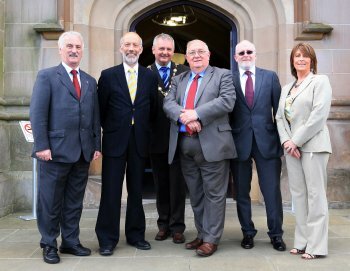 Former Magee Provost Professor Tom Fraser welcomed Justice Minister David Ford, Mayor Councillor Paul Fleming and representatives of Derry City Council CSP to the Magee campus. Also pictured are, on left Alderman Drew Thompson, chairman, Derry CSP, Robert McKnight, Community Safety, Unit Dept of Justice and Agnes Kennedy, Community Safety Manager, Derry City Council. Justice Minister David Ford has praised Community Safety Partnerships (CSPs) for delivering local solutions to local problems during a visit to the University of Ulster’s Magee campus. He was speaking after a visit to the Derry City Council CSP Community Safety Wardens project. The initiative is targeted at students attending the University and provides a safer environment and a greater sense of security within the campus and surrounding area. The University hosted the Minister’s meeting with the stakeholders and wardens who operate the scheme. He was greeted on arrival by Professor Tom Fraser, the former Provost of Magee, and also met the Mayor, Councillor Paul Fleming. Professor Fraser praised the “shared sense of commitment” that had made the wardens scheme a success. During a round-table meeting with the partners in the project – who comprise the University, PSNI, Housing Executive and Derry City Council— Magee-based Head of Residential services Gareth Kennedy gave the Minister a detailed briefing about project. "Local people are best placed to combat local problems. The local community safety audit highlighted residents’ concerns and as a result the CSP in conjunction with the University of Ulster have produced this project that will provide a safer environment and a greater sense of security to all those in the vicinity of the University. The warden project began in 2006 when the University, PSNI and Housing Executive and Derry CSP agreed to fund jointly the appointment of four community wardens for the University area. The wardens operate a night from Sunday evening to Friday morning when the majority of the students are in the city. They are trained in health and safety, first aid, conflict resolution and personal safety.